Runners, they wouldn’t be able to complete their puzzle without you! 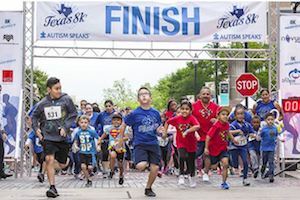 With autism becoming the fastest-growing serious developmental disability in the US with 1 in 68 children diagnosed, Autism Speaks is looking to raise awareness while having a great time during the annual Houston 8K and 1K Kid’s Fun Run in Sugar Land Town Square, presented by Novum Energy and BAT Commodities. So, lace up those running shoes for an event that means so much more than just 4.97 miles. Recruit friends and family for your team and get ready to run, walk or virtual run for a great cause.